After surfing through Rena’s Jewelry Business Blog, I decided to start making earring cards from pretty cardstock that I picked up in a pack on clearance at the local Michael’s Arts & Crafts store. Up to that point, I had been making my own earring cards out of recycled materials (old manila file folders) because I really wanted to keep my carbon footprint as light as possible. Part of me thought they looked cool and kitchy, but the other part of me realized that to most people who don’t have quite the passion for “green things” as I do, they would look unprofessional and cheap. I read Rena’s article on cardstock earring cards and decided to give it a try. What a breeze! At first I tried plain mauve textured cardstock and stamped it with a pretty stamper and gold ink for what I hoped would be an elegant effect, but the combination just didn’t seem to work. I tried a different color ink, using the same stamper and mauve cardstock and still… didn’t find that my designs “popped”! I finally decided to not use the stamper and ink at all and changed the cardstock out for a pretty floral/scroll wedding-ish type of print. 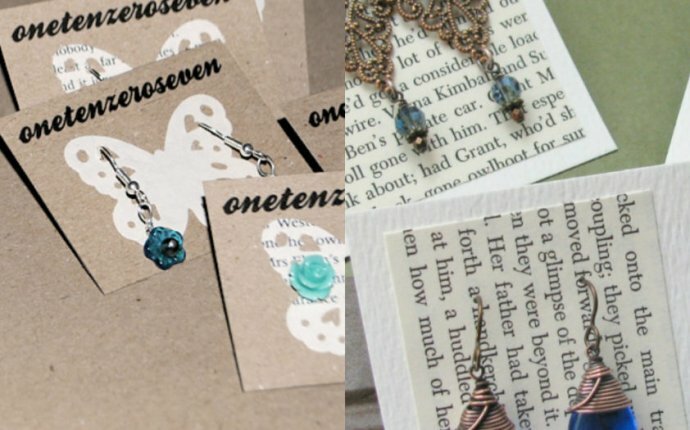 I added a small sticker at the bottom with my company name, web address and email address and found that these unique earring cards really make my designs look special. Thanks for a great idea, Rena! I love how the card’s pretty pattern accentuates your earrings without overpowering them, and adds an overall effect of elegance and quality. Your inspiration may have started with something on my site, but definitely your own artistry shines through in how you used the idea! Thanks so much for sharing your lovely cards. I’m sure they look fantastic in your display – and they’re definitely pretty enough for customers to keep after they remove the earrings. Great idea and very pretty! I was thinking of using my business cards, but I like this idea much better, especially with the sticker on the bottom. Also, thanks so much for the kind comments on my display idea page. I love hearing what other jewelry people think of my ideas. And by the way, I love your jewelry! It’s so funky and fun. Best of luck to you! Thanks so much! I just now got a chance to check ut your site and would like to compliment you on your “green jewelry”. I am still in the design stages of my own green jewelry collection and can really appreciate another artist’s work. I’m glad to see the green market alive and well! I love this idea and I love the fact that you put your company name at the bottom. They don’t look cheap at all but really professional. Awesome job!! I really like that idea. I think I could do something similar with a business card printed differently than the usual manner. My question is this- How do you use the earrings on those cards in your display? Can you display them without buying those plastic hangers for the backs? I use watercolor paper for my earring cards. The surface is a bit textured and when you use the right font, it almost looks like you hand wrote your info on the card. I love them! You don’t have to purchase the plastic pieces for the back. 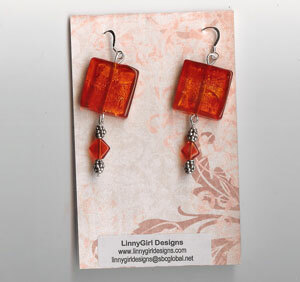 You can design your business card/earring card so that the top 1/2 inch folds over. This allows you to lay it on a table and it tilts upwards for the earrings to lay nicely. I’ve started using a self inking stamp available at an office supply (Staples) for minimum cost. It’s much less work and since I had it made with black ink, it doesn’t detract from the earrings. I will look for cardstock with designs as you suggested. I’ve been using plain, but like your idea of paper with a design motif. I’ve also used greeting cards to make my earring cards. I stamp my information on the white side for the earring display and the back is the card design.